Home › News › FlyEx.com: Is this retail travel’s Airbnb? FlyEx.com: Is this retail travel’s Airbnb? 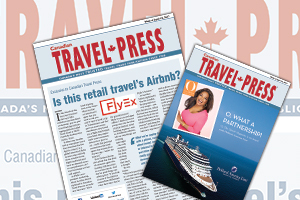 In an exclusive story in this week’s digital edition of Canadian Travel Press, executive editor, Bob Mowat reports that a San Francisco-based start-up called FlyEx has rolled out a personalized, on-demand, peer-to-peer travel booking and messaging platform (called Travel Chat) at SXSW (South By Southwest) in Austin, Texas. It allows any traveller with a smartphone (once they download the free App) to connect to a global network of FlyEx Aviators who will help those travellers book flights and hotels and have on-demand access to comprehensive, 24/7 travel concierge services and support.